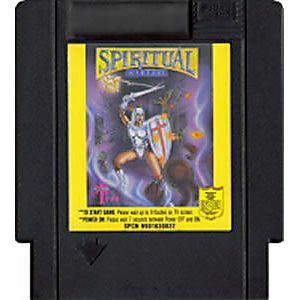 Spiritual Warfare original NES Nintendo Game cartridge only - Cleaned Tested and Guaranteed to Work! 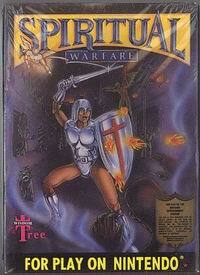 Spiritual Warfare for the NES plays basically like a Legend of Zelda clone. You have an overhead view and a large world to explore that is split into various screens. Instead of a sword you throw literal "Fruits of the Spirit" as your weapon. 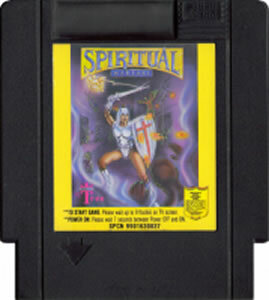 Developed by Wisdom Tree, Spiritual Warfare is a "Christian" game, though it is hard to discern what sort of audience the unlicensed company was going for when they released this. It has the potential to come off as slightly offensive to some, but I personally thought it was very funny. I wouldn't recommend it (or any other Wisdom Tree game) for Christian education, but this one might be worth a try if you have a sense of humor and a hankering for Zelda knock-offs.